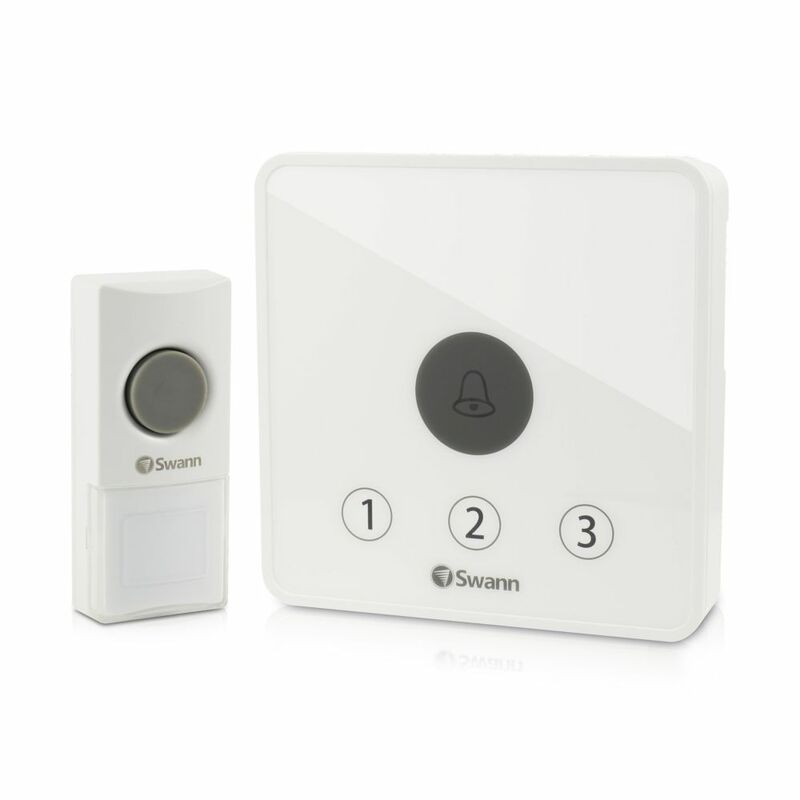 Swann's Wireless Doorbell Kit is an easy to use doorway alert system that suits almost any home. With its 100% cable-free design its made for DIY installation with everything you need in the pack. The Doorbell Unit includes 36 built-in chimes and allows you to pre-select which of the 36 you want to hear whenever you like. The receiver unit lights up when the Doorbell is pressed and you can select one of the 3 volume levels for the chimes, or you can select silent mode with blue flashing lights to not disturb sleeping children or guests inside. You can position the Doorbell Unit at your front or back doorway up to 200ft (60m) away from the receiver unit. Even better, being battery powered (it runs off 3 x AA batteries, not included) you can place the unit virtually anywhere allowing it to be moved around the home and relocated if you're moving house. The camera with the quality your photos deserve, the EOS Rebel T6 can be ideal for smartphone or digital point-and-shoot camera users looking to step up their imaging game. It's equipped with an 18.0 Megapixel CMOS image sensor and the DIGIC 4+ Image Processor for highly detailed, vibrant photos and videos even in low light. Whether you're out on an adventure hike or snapping candids of your friends during a late night out, the EOS Rebel T6 can help you take photos you'll want to show off. Built-in Wi-Fi. and NFC connectivity make it easy to share, print, or get your favorite pictures up on select social media sites for your friends, family and the world to see. If you're new to DSLRs, Scene Intelligent Auto mode can conveniently and automatically adjust the camera's settings to suit your subject. Easy to use and simple to share with, the EOS Rebel T6 delivers high image quality that's sure to catch the audience's eye. With its discreet design, our QTN Series dome IP camera can help safeguard your corporate office or industrial property while remaining less conspicuous than a traditional security camera. Enjoy superior image quality courtesy of the 3 megapixel sensor, delivering 50% more pixels than 1080P for enhanced clarity. Wide Dynamic Range enriches your image quality with deep blacks, contrasted whites and vivid colours so images appear true to life. 24 infrared LEDs give you up to 80 ft. of night vision, allowing you to see what's going on day or night. Need to monitor multiple properties or offices. Not a problem. Just plug this IP camera into a QT NVR, or an onsite router, and it's instantly powered and ready to be viewed remotely as a standalone unit or as a part of your QTN system. You can also record to an NVR that's offsite for increased security. A durable, metal body and IP66-rated weatherproof construction make this camera ideal for indoor or outdoor use. Q-SEE's QTN Series IP cameras combine uncompromising visual quality, environmental versatility and extensive functionality all in a durable, metal body, perfect for monitoring your corporate office location or large industrial property. The 3 megapixel sensor delivers 50% more pixels than 1080P, rendering details in stunning clarity. Wide Dynamic Range enriches your image quality with deeper blacks, contrasted whites and vivid colours so images appear true to life. Night vision technology lets you capture what's going on day or night. View live feeds and recorded footage right from your mobile device whether you're on the tee or at the big game. IP technology gives you the flexibility to install your camera in remote locations and record video to an NVR located across your property, across town or even across the world. An IP66 rating guarantees your camera is protected against the elements, perfect for indoor or outdoor use. Monitor your 3-4-bedroom home or small office with an 8-Channel NVR and 4 HD Plus 3MP cameras. Capture video in amazing HD Plus 3MP resolution and ensure you don't miss a single important detail. Our night vision camera technology provides you with around-the-clock protection and peace of mind. Smart System features allow you to target areas for motion detections, or send specialized alerts directly to your smartphone. Connect to the NVR and view what's going on anytime and put your mind at ease right from your phone, tablet, or computer. Home Doorbell Kit Swann's Wireless Doorbell Kit is an easy to use doorway alert system that suits almost any home. With its 100% cable-free design its made for DIY installation with everything you need in the pack. The Doorbell Unit includes 36 built-in chimes and allows you to pre-select which of the 36 you want to hear whenever you like. The receiver unit lights up when the Doorbell is pressed and you can select one of the 3 volume levels for the chimes, or you can select silent mode with blue flashing lights to not disturb sleeping children or guests inside. You can position the Doorbell Unit at your front or back doorway up to 200ft (60m) away from the receiver unit. Even better, being battery powered (it runs off 3 x AA batteries, not included) you can place the unit virtually anywhere allowing it to be moved around the home and relocated if you're moving house. Home Doorbell Kit is rated 4.6 out of 5 by 5. Rated 5 out of 5 by sexybrit42 from I put in the batteries and it hooked up immediately. I have the base station at 30 feet from the ... I put in the batteries and it hooked up immediately. I have the base station at 30 feet from the bell. No problem. Rated 5 out of 5 by SRW from Easy to install. Nice selection of tones. It works well.... Easy to install. Nice selection of tones. It works well. Rated 5 out of 5 by Dwight T. from Great product! Bought this and 2 extra motion sensors to add to the swann driveway alert I already had. Now whether I am in the house or my shop I know if anyone is coming up the driveway or at my home. Works flawlessly! Rated 5 out of 5 by Dave F. from Perfect for my parents I used this for my elderly parents who were unable to always hear the regular home doorbell. Yes, it is loud, but that is exactly what they needed. Rated 3 out of 5 by Nauta from Too darn loud. The instructions with the unit are inadequate. There are three volume levels: very loud, ear piercing, completely intolerable. They claim to have three dozen different chimes but they do not tell you how to change the setting. can i connect/pair a motion/pir extra alert sensors in the other two channels instead of doorbell button? Yes, you are able to pair 2 additional senors to the base unit.